It is a banyan fig (Ficus subgenus Urostigma) that commonly starts life as an epiphyte high in the crown of another tree; it then sends roots down to the ground which envelop the trunk of the host tree and slowly strangle it. It can also grow as a free-standing tree on its own, growing up to 12–15 m (39–49 ft) tall. Above: an example of a lyrate leaf. 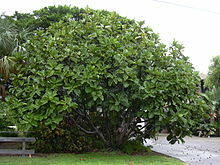 Ficus lyrata leaves are lyrate, meaning that they resemble a lyre. The leaves are variable in shape, but often with a broad apex and narrow middle, resembling a lyre or fiddle; they are up to 45 cm (18 in) long and 30 cm (12 in) broad, though usually smaller, with a leathery texture, prominent veins and a wavy margin. The fruit is a green fig 2.5–3 cm (1-¼ in) diameter. It is a popular ornamental tree in subtropical and tropical gardens, and is also grown as a houseplant in temperate areas, where it usually stays shorter and fails to flower or fruit. It is hardy down to 10 °C (50 °F), so specimens may be placed outside during warm periods. ^ a b "Ficus lyrata AGM". Royal Horticultural Society. Retrieved 27 July 2013. ^ "AGM Plants - Ornamental" (PDF). Royal Horticultural Society. July 2017. p. 39. Retrieved 27 February 2018. Dressler, S.; Schmidt, M. & Zizka, G. (2014). "Ficus lyrata". African plants – a Photo Guide. Frankfurt/Main: Forschungsinstitut Senckenberg. This Moraceae article is a stub. You can help Wikipedia by expanding it. This page was last edited on 11 October 2018, at 15:24 (UTC).